History has lots to teach us about how positive social change is made. For example, the persistence exhibited in Lawrence 105 years ago to build strength out of diversity and win a hard fought strike against powerful woolen mill owners is quite instructive. However, an accurate depiction of the strike is largely missing from high school and college textbooks. Why does this matter? 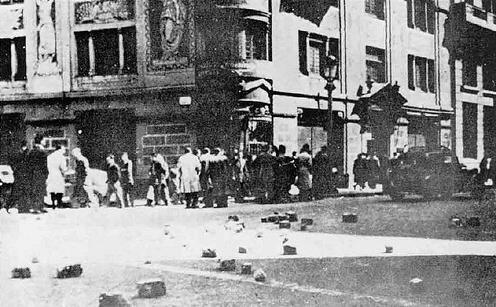 Should students simply learn the standard textbook lessons about the Bread and Roses Strike and other movements for social change, they’ll be led to believe that we can bide our time, waiting for the next spontaneous reaction to injustice to occur. This is not how social change is made. 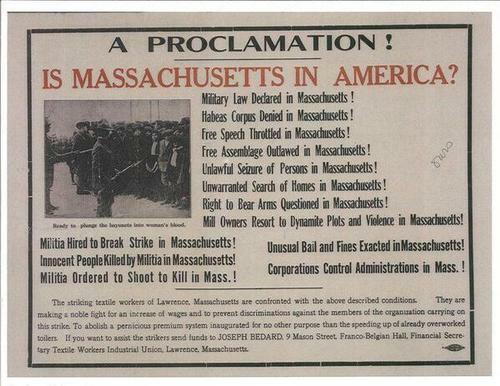 The Bread and Roses Strike in Lawrence, Massachusetts, concluded with an affirmative vote on a contract settlement on March 14, 1912. One of the most significant struggles in U.S. labor history, largely due to its level of organization and collaboration across ethnic and gender lines, thousands of workers (the majority women) engaged in a well-organized walkout, standing firm against entrenched mill owners and their militia and police. Workers maintained soup kitchens and nurseries for children. Meetings were simultaneously translated into nearly 30 languages. Representatives from every nationality formed a 50-person strike leadership group. Immigrant workers, male and female, stood together and won! The walkout is not mentioned in 10 out of 12 major U.S. history textbooks. Yet, despite this incredible organization, the walkout is not mentioned in 10 out of 12 major U.S. history textbooks according to a 2011 survey conducted by the Zinn Education Project. The two books that reference the strike describe it as “erupting . . . in the textile mills of Lawrence, Massachusetts” (A People and a Nation, Houghton Mifflin) and “Workers spontaneously went on strike” (Give Me Liberty!, Norton). The image of workers spontaneously saying “enough is enough” is inspiring; but it is not true. Organization grew out of the experiences immigrant workers brought with them to Lawrence. Franco-Belgians established a cooperative modeled after institutions in France and Belgium, in 1905. The cooperative operated a bakery, grocery store, and meeting hall. Lawrence workers carried their labor histories with them into the city’s mills and drew on their experiences to build vital worker organizations across the city. Solidarity was not magically born on January 11 and 12, 1912, when workers walked off the job. Reporters discerned this intricate network of relationships. The February 10, 1912, issue of The Outlook noted: “There are almost as many nationalities here in Lawrence as there are in your Babel of New York. The workers are American, English, Scotch, Irish, German, French, Flemish, French-Canadian, Polish, Italian, Syrian, Russian, Armenian. I heard speeches in six languages. You might not suspect that a common sentiment could animate these diverse groups and weld them into a fighting unit. Nevertheless they have struck—struck as a single homogeneous body.” Minimizing organization misses the roles women played throughout the strike. Workers, wives, and mothers, they forged strong alliances with their tenement neighbors, this contributed to the solidarity essential to sustaining the strike. Such fanciful instruction diminishes the importance of organizing. Suggesting that the 1912 strike started in a flash over a wage cut diminishes the behavior of immigrant laborers who built unity out of diversity. A more contemporary example is the way civil rights history is taught. Rosa Parks sits down, Martin Luther King steps up, and Lyndon Johnson signs the Civil Rights and Voting Rights Acts. Such fanciful instruction diminishes the importance of organizing in 2017 for things like a living wage and against immigrant deportations, and racial profiling. Teaching outside the textbook and beyond the standardized test about events like the Bread and Roses Strike matters. Could this be why there are moves afoot to de-fund organizations like the National Endowment for the Humanities and to ban peoples’ history books from some of our schools?